Powerful, riveting, and real. 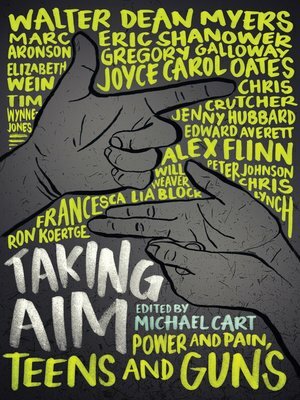 Sixteen celebrated authors bring us raw, insightful stories that explore guns and teens in a fiction collection that is thought provoking and emotionally gripping. For fans of Forgive Me, Leonard Peacock and Give a Boy a Gun, and with an array of YA talent like the late great Walter Dean Myers, the poetic Joyce Carol Oates, the prophetic Elizabeth Wein, and the gritty Chris Crutcher, these are evocative voices that each has a different perspective to give. Capturing the hurt and the healing, victims and perpetrators, these stories get to the heart of the matter. Other acclaimed contributors are Marc Aronson, Edward Averett, Francesca Lia Block, Alex Flinn, Gregory Galloway, Jenny Hubbard, Peter Johnson, Ron Koertge, Chris Lynch, Eric Shanower, Will Weaver, and Tim Wynne-Jones.